WHAT: The Illinois Innocence Project (IIP), based at the University of Illinois Springfield, will host one of dozens of events throughout the world recognizing International Wrongful Conviction Day. The public is invited to a visual display recognizing individuals who were wrongly convicted and imprisoned for crimes they did not commit. WHEN: Monday, October 2, 2017, from 10 a.m. to 6 p.m. 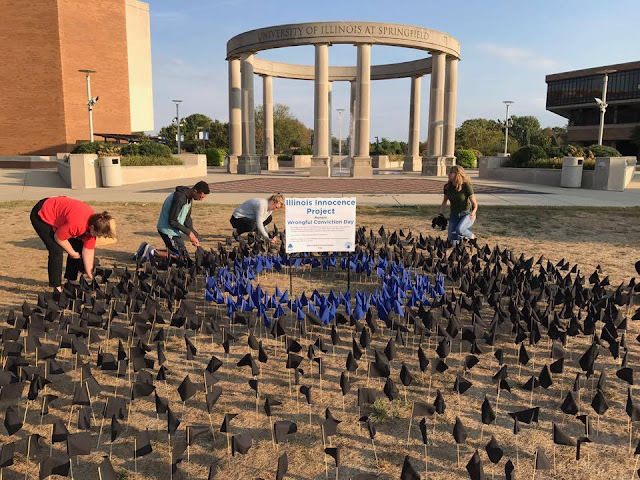 DETAILS: UIS students interning and volunteering with the Illinois Innocence Project have created a flag display recognizing the 2,098 innocent men and women who were convicted of crimes they did not commit and have been exonerated since 1989. “UIS blue” flags in the display represent 199 Illinois exonerees. Collectively, these exonerees lost 18,250 years of their lives, according to the National Registry of Exonerations. Illinois exonerees lost a total of 2,135 years of their lives. An overwhelming majority of exonerees in the United States are people of color. International Wrongful Conviction Day began four years ago with the Association in Defense of the Wrongly Convicted. The day is designed to recognize the tremendous personal, social and legal costs associated with wrongful criminal convictions. To date, seven nations participate with events designed to inform and educate the international community on the causes, consequences and complications associated with wrongful criminal convictions. For more information on the Illinois Innocence Project – Wrongful Conviction Day events, contact Lauren Myerscough-Mueller at 217/206-6051. WHAT: The University of Illinois Springfield Engaged Citizenship Common Experience (ECCE) Speaker Series presents a panel discussion on “Examining Barriers to Social Change: Challenges of Youth, Young Adults and Adults to Creating, Impacting and Enacting Reform.” This event is free and open to the public. WHEN: Wednesday, October 18, 2017, at 5 p.m. DETAILS: Each generation has faced life circumstances which influence the behaviors and responses to the needs of others. While society evolves in its efforts of equality, tolerance, acceptance and understanding, generations must explore the limitations placed on change. Panelists will discuss societal constructs, organizational barriers, generational differences and additional political factors on education, career-focus, the place of diversity in society and more. Panelists include Tommy Jackson III, director of advising for University College at Kennesaw State University in Georgia; Marcus Bright, director of the Male Development & Empowerment Center/Black Male Initiatives at City University of New York, adjunct instructor at Lynn University (FL) and a commentator for the Huffington Post; and Utz McKnight, professor of political science and chair of gender and race studies at the University of Alabama. The 15th annual Lincoln Legacy Lectures presented by the University of Illinois Springfield will be held from 7 to 9 p.m. on Thursday, October 12, 2017, in Brookens Auditorium, located on the lower level of Brookens Library at UIS. This year’s topic is “Lincoln and Education.” The lectures, and a reception and book signing that will immediately follow, are free and open to the public. No reservation is required. This year’s featured speakers are Robert Bray, Colwell Professor of English Emeritus at Illinois Wesleyan University, and Paula R. Shotwell, educator and creator of the Lincoln Living History Project. Michael Burlingame, Chancellor Naomi B. Lynn Distinguished Chair in Lincoln Studies at UIS, will give opening remarks on “Lincoln’s Views on Education,” and serve as moderator. In the first lecture, Bray will describe “Lincoln’s Self-Education: The Personal and the Public.” In the second lecture, Shotwell will explore “Why Lincoln? : An Examination of Lincoln’s Role in Today’s Education.” The speakers will discuss the contemporary implications of their lectures at the beginning of the Q & A session. 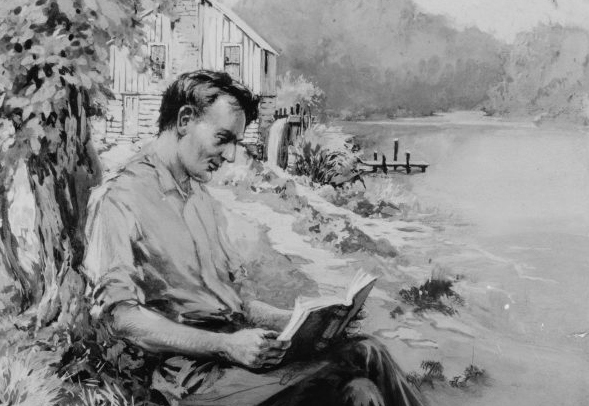 Bray is the author of a prize-winning book, “Reading with Lincoln” (Southern Illinois University Press, 2010). Shotwell developed a Living History Project with the staff of the Old State Capitol in Springfield, which was given a Superior Achievement Award by the Illinois Association of Museums. Burlingame is the author of the two-volume biography, “Abraham Lincoln: A Life” (Johns Hopkins University Press, paper, 2012). The Lincoln Legacy Lecture Series is sponsored by the UIS Center for State Policy and Leadership, in cooperation with the Chancellor Naomi B. Lynn Distinguished Chair in Lincoln Studies. Cosponsors of this year's event include the Abraham Lincoln Association, Brookens Library John Holtz Memorial Lecture, Engaged Citizenship Speaker Series, Gobberdiel Endowment, Illinois State Historical Society, Looking for Lincoln Heritage Coalition, NPR Illinois, UIS Colleges of Education and Human Services and Liberal Arts and Sciences, and the UIS Office of Advancement. Doors will open at 6 p.m. Seating in Brookens Auditorium is limited; however, overflow seating will be available in the Public Affairs Center, Level 1, Conference Rooms C/D, where the audience can watch a large-screen live video feed. Those unable to attend in person can watch a live webcast at the time of the event. For more information, contact the Center for State Policy and Leadership at 217/206-7163 or visit the Lincoln Legacy Lectures website. The University of Illinois Springfield Visual Arts Gallery presents “Live Through This,” a UIS Engaged Citizen Common Experience (ECCE) lecture and corresponding solo exhibition from photographer, writer and suicide awareness activist Dese’Rae L. Stage. Stage will present her lecture on Thursday, September 28 from 5:30 to 6:30 p.m. in Brookens Auditorium. An exhibition reception will immediately follow at the UIS Visual Arts Gallery from 6:30 to 8 p.m. The exhibition will run from Thursday, September 28 through Thursday, October 19. 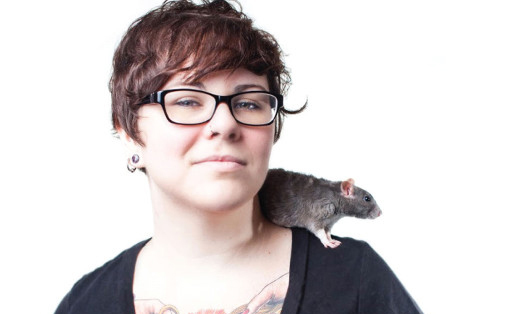 Stage is a Philadelphia-based artist, suicide awareness activist, and public speaker. She struggled with self-injury for nine years and survived a suicide attempt catalyzed by an emotionally and physically abusive relationship. These experiences, coupled with the loss of friends to suicide and the lack of resources for attempt survivors, prompted her to create “Live Through This”. “Live Through This” is a collection of portraits and true stories of 180 suicide attempt survivors in 33 cities across the United States. “Live Through This” reminds us that suicide is a human issue by putting faces and names to the statistics that have been the only representation of attempt survivors in the past. Stage speaks at universities and conferences nationwide. She provided commentary for The Glenn Beck Program, Fox News and BBC Radio. Her writing was published by Cosmopolitan, Huffington Post, and XoJane. In January 2017, she received a SXSW Community Service award, the American Association of Suicidology’s inaugural Transforming Lived Experience Award and received Investigation Discovery’s Every Day Hero award. “Live Through This” has received extensive media coverage, including features in The New York Times, Associated Press, NPR, and more. Stage is featured in an upcoming documentary about suicide prevention advocates called “The S Word,” due out later this year. “Live Through This” is co-sponsored by the UIS Visual Arts Gallery, The UIS ECCE Speaker Series, NPR Illinois (WUIS) and the UIS Office of Gender and Sexuality Services. “Live Through This” launches Queertober at UIS, a month-long celebration in October that features educational, informative, and social events that raise awareness and provide support for sexual and gender minority students (LGBTQIA+) and communities at UIS. The Visual Arts Gallery is centrally located on the UIS campus in the Health and Science Building, Room 201, and is open Monday through Thursday 11 a.m. to 6 p.m. The Access Gallery is located in the Visual and Performing Arts Building and is open Monday through Friday 10 a.m. to 6 p.m.
For more information, visit the UIS Visual Arts Gallery website at www.uis.edu/visualarts/gallery or contact the gallery at 217/206-6506 or alach@uis.edu. UIS Lunch & Learn Series presents "Archaeological Treasures"
WHAT: The University of Illinois Springfield’s Office of Advancement, Alumni SAGE Society, Chancellor’s Office and the Illinois State Historical Society presents “Archaeological Treasures” as part of the Lunch and Learn Series. WHEN: Thursday, September 28, 2017, from 11:30 a.m. to 1:30 p.m. DETAILS: Lynn Fisher, UIS associate professor, will discuss her archeological research and how the treasures uncovered lead to understanding human evolution. Presenting on new archaeological research and recent discoveries in central Illinois and the Midwest will be Terrance Martin, curator emeritus of the Illinois State Museum and an adjunct professor of anthropology at Michigan State University. The cost for the hot buffet lunch and program is $23/per person. Reservations are requested, as seating is limited. A discounted series subscription is available for $60/per person before September 21. 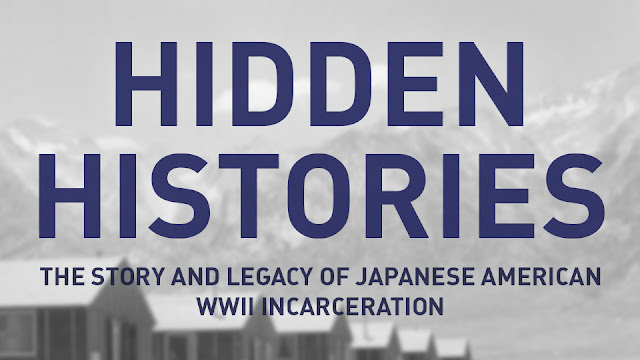 Other upcoming Lunch & Learn events include “Transcending Borders” on October 17 and “Illinois Stories” on November 15. These lunch-time programs will stimulate thinking as they build upon the university's tradition of open and intelligent dialogue.